Part one of “Gearing Up” got into my train of thought for choosing an online music gear retailer by way of conscious consumerism, and a bit about the company I settled on. In this post, I’ll be gushing over all my cool new toys, and why I just had to have them. I had intended to follow this wisdom by employing the tools already in my possession, but at every turn they proved to be outdated to the point of inadequacy. This whole ordeal actually turned into a lesson on how the nature of technological advance has us buying more and more gadgets sooner and sooner before they’re rendered obsolete. Admittedly, the gear I’d planned to use was pushing the age limits, but I figured I could make it work. I was wrong. My primary goal at the moment is to get some decent recordings in the can. I’m not an engineer, and I realize that I’ll have to invest in some studio time once I reach a point where professional quality is in order. But at this juncture, I’m just looking to learn how to tweak the knobs well enough to produce some demos for gig booking purposes and lay down rough ideas at will. About seven years ago, I bought a ProTools bundle (version 7.3) complete with an M-Audio MobilePre USB interface, AKG M70 headphones, and a MXL V63M condenser mic. Far from fancy, but it did the trick. I’ve set up this rig on three different laptops since then, and fiddled around with it for week-long stints a dozen or so times over the years. But I never stuck with it long enough to get a good grasp on the software, nor any tracks with a production value worth pushing. Determined to finally learn the ropes and get in a recording routine, I went to configure the rig again. But this time it wasn’t happening. The interface was so out-of-date I couldn’t even find a driver for it online that worked. One of the ears on the headphones was shot, and the mic was unresponsive. Isn’t it funny how the tools you use a lot seem to last forever, but the ones you barely touch seem to break for no apparent reason? Whatever the case, my former recording setup had been reduced to a few more items tossed on the e-waste pile. I figured if I was in the market for new recording equipment, I might as well replace all my other faulty gear while I’m at it. My decade-old PA system was down to one working speaker, and a ragged speakon cable that I prayed would work every time I plugged it in before a gig. The screw grooves were so worn on my mic stand the boom pole would fly off if someone bumped it. My vocal mic was rusty, and most of my cords were cutting out. 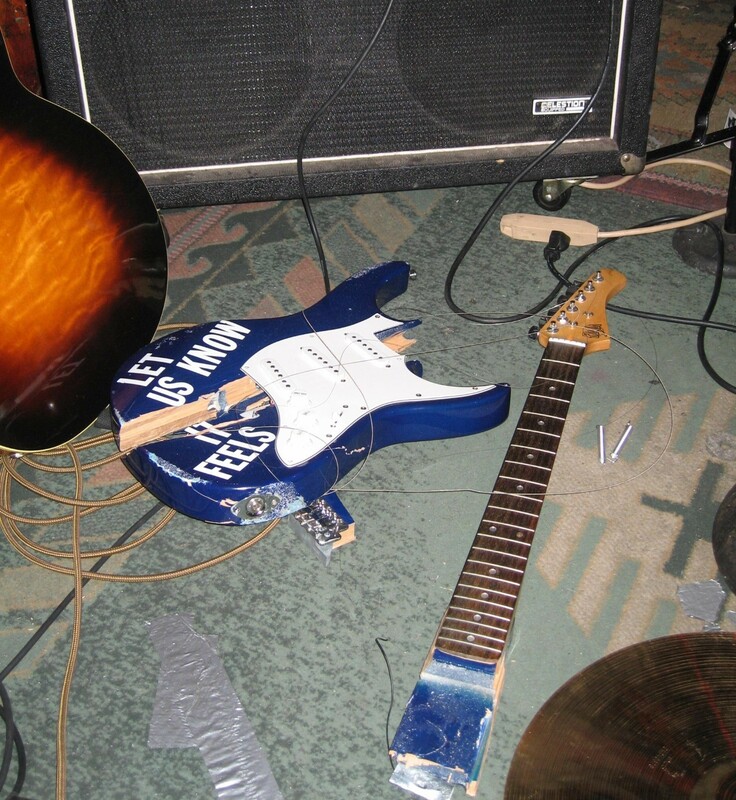 Worst of all, my main guitar had developed a wicked fret buzz. I was barely equipped to book shows, let alone record songs, until I reestablished my arsenal. I started by hitting up a few local music stores for the small stuff, scoring a new boom stand and some ¼-inch and XLR cables at Klaverenga Guitar & Piano in downtown Lafayette. I then got a fresh setup on my Maton EM225C Acoustic Electric courtesy of Don Leuck at Don’s Guitars, and picked up a new Gator case to replace the original tweed hardshell, which has been in critical condition for quite some time. I also snagged a new Snark tuner, and the improved display is a beautiful thing to behold. As for a new PA, I was looking for something small enough to travel light but powerful enough to rock a good-sized room. This tour is going to be all about minimalism, so I wanted to find the most compact portable party machine possible. Preferably, I can book a lot of venues with in-house PA systems, but I have to anticipate any type of situation I can imagine. Amplification is the only real essential. My old Behringer PA has taken a hefty licking and kept on ticking, so it’s a brand I trust. They also make a line of all-in-one rigs that lock together into one self-contained unit. I went for the beefiest model, a Behringer Europort PPA2000BT. 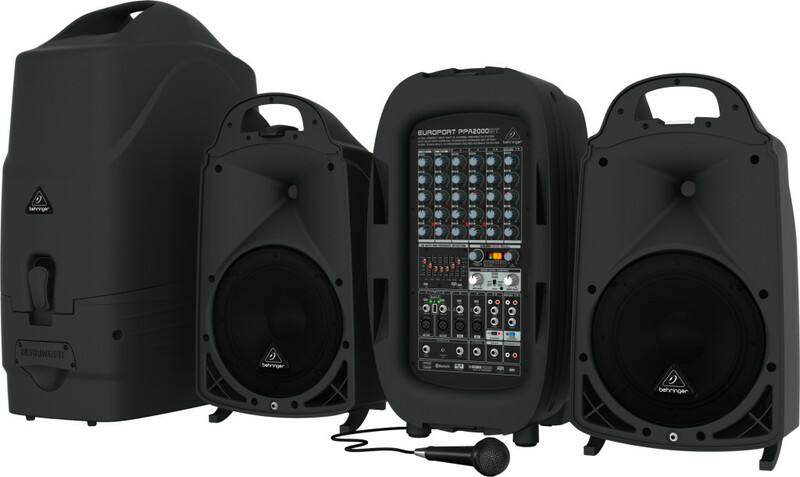 It features a 2,000-watt, 8-channel powered mixer, 10-inch woofers, 7-band Graphic EQ with FBQ feedback detection, built-in KLARK TEKNIK effects, wireless mic compatibility and Bluetooth connectivity. Sweetwater happened to have a display model on hand, so I went with the demo and saved 80 bucks. There’s no shame in second-hand. Every spare part I can commandeer is a new part that doesn’t have to be made. I hate what Craigslist has done to newspapers, but I love what it’s done for the environment. As far as recording, ProTools is the industry standard DAW, but it’s a fairly complicated program and I don’t really like messing with the whole iLok thing. I’m a beginner and I’m looking to keep it simple, so I chose to go with the PreSonus Music Creation Suite. This all-PreSonus package included the Studio One Artist 2 DAW software, an AudioBox USB interface, HD3 headphones, M7 large-diaphragm condenser mic, PS49 USB MIDI keyboard, and a four-input powered USB hub. They also threw in Notion software and a Nimbit account. This leaves me pretty much set up to learn and accomplish anything that would be covered in an entry-level audio engineering classroom. The rest comes down to video tutorials and on-the-job experience. So here’s the kicker… After buying a whole new recording suite, I couldn’t even set it up on my laptop. My old MacBook couldn’t be updated past Snow Leopard, and the Studio One software required at least Mavericks. So, I had to pony up for an operating system that could speak the present tense. At last, I feel I’m as updated and intonated as I need to be, so I don’t foresee any more splurges in the near future. It’s now just a matter of making the most of what I have to work with at any given moment. In total, “Gearing Up” turned out to be about a $2,300 investment. The potential returns are limitless.